Normal rice wine (NRW) and waxy rice wine (WRW) were fermented to study the relationship between the structure of starch as well as the taste and texture of rice wine. The total starch content of NRW decreased to 21.2%, and that of WRW decreased to 15.6%. The water-soluble sugar content of NRW increased to 169.3, and that of WRW increased to 194.4 mg/g. The ethanol content of NRW increased to 6.5%, and that of WRW increased to 8.9%. These changes indicated that WRW exhibited higher quality than NRW. 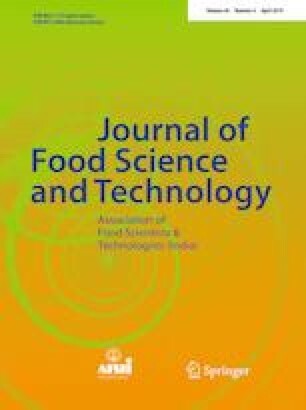 Sweetness was negatively correlated with total starch content and positively correlated with ethanol content. Starch molecules were degraded by enzymolysis, thereby enhancing crystallinity. The size of starch particle was negatively correlated with crystallinity, whereas the chewiness and gumminess of vinasse (fermented rice grains) were positively correlated with the size of starch particle and negatively correlated with crystallinity. The higher degrees of chewiness and gumminess of vinasse render the texture of WRW superior to that of NRW. The results indicated that WRW is superior to NRW in taste and texture because of the difference in starch structure. The authors are grateful for support from Fundamental Research Funds for the Central Universities (No. 2015ZCQ-SW-04), the Beijing Forestry University Innovation and Entrepreneurship Training Program for College Students (No. S201610022053), and Beijing Science and Technology Innovation Base Cultivation and Development Projects (IG201710C1).